As the 420 Archive builds its collection of primary documents, sound and audio recordings, photographs, cultural artifacts, and digital objects that illustrate the history of marijuana prohibition in North America, we have multiple volunteering and internship opportunities for anyone with an interest in history, genealogy, audio production/editing, social media/management, website enhancement, information/records management, and eventually museum studies. Projects range from preparing and inventorying documents and photographs for digitization projects, to creating preservation materials and preserving documents, photographs, and objects, updating descriptions of and cataloging collections, researching historical items or documents, and much more. 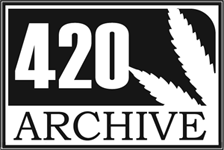 The 420 Archive has a number of projects it is currently working on, including the Medical Cannabis Oral History Project, the Cannabis Activism Oral History Project, and the Emerald Triangle Oral History Project. We also conduct interviews with activists and early cannabis pioneers from across the country on their lives surrounding cannabis. We are looking for interviewers to help us collect the stories of marijuana prohibition. In addition to conducting and recording interviews, we need individuals who can edit current oral history recordings for length, utilize audio editing software to improve sound quality, digitize older recordings, post recordings online, transcribe recordings, and create metadata for interviews.